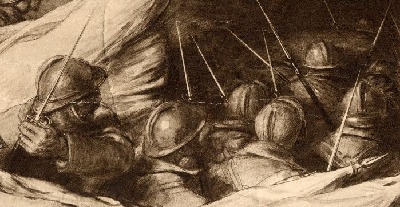 In this section it has been possible to show the certificates of two officers who opposed each other on the field of battle. A brief description of the battle is included, as seen by the French, and as seen by the Germans. A company commander with remarkable drive, he succeeds in getting the utmost from his men. In the course of the operations from the 26th of September to the 3rd of October 1918 he lead his company in attacks on formidably defended enemy positions. On the 26th of September he took the objectives assigned to him along with 50 prisoners. On the 28th of September he led his company through 1500m of open ground covered by the enemy and was one of the first to penetrate the enemy position where they took 30 prisoners. In the position they seized 4 canons and a large number of machine guns. They then defended this position against violent counter attacks. 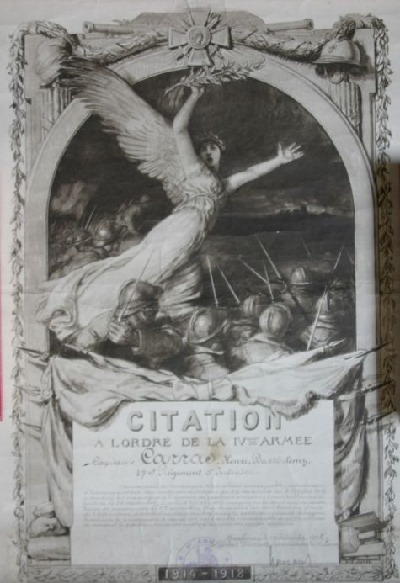 Signed by General Gouraud, commander of the 4th Army. Major Richard Sartor was the Divisions Adjutant for the 15th Bavarian Infantry Division, he recieved a commendation certificate for his part in supporting the divisional HQ in the field during the battle, the 15th Bavarian Division was facing attacks by Captain Carras's regiment. At 5.25 am on the 26th of September 1918 the Franco-American Champagne-Argonne offensive got under way. Only a number fortified positions managed to slow the advance as most of the German Infantrymen were sheltering in their bunkers, their artillery largely ineffective. 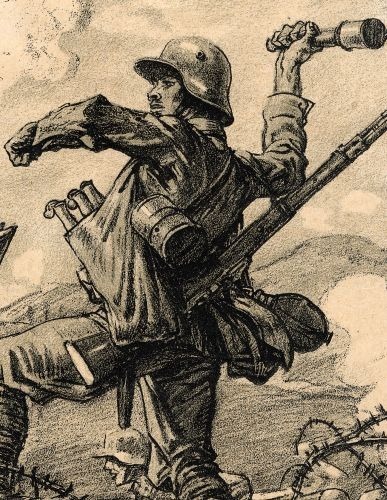 Although the Germans resisted in some sectors the large amount of prisoners taken in the offensive implies a lack of enthusiasm on the part of the German defenders. On the 26th of September General Spires 22eme division took the piles of rubble that were once the farm of Navarin, the 167eme and 43eme divisions (General Schmidt and Michel) fought brilliantly to capture the Butte de Souain and the Mont Muret, the French 2eme Division with its Tirailleurs pushed the enemy off the Butte du Mesnil and the men of General Leboucq's division took the heights on the northern bank of the river Dormoise. In other sectors of the offensive many positions that had cost rivers of blood in the years before fell to the French, the Butte de Tahure and the Main-de-Massiges being two instantly recognisable names. General Gourand's 4th Army had advanced 5-6km's and had taken 300 artillery pieces and 13200 prisoners. To the east the American troops were cutting their teeth in the Argonne, the 1st Corps passing Four de Paris, the 5th corps taking Vauquois and Varennes and the 3rd Corps chasing the enemy from Malancourt to Montfaucon. The Americans advanced approximately 7km's taking 7000 prisoners during the first day. The 27th of September saw a subtle change in tempo, General von Einem requested and received the few reserves that were available and with these was able to strengthen his defences. Luckily for the allied troops the too cautious German command had pulled its artillery too far to the rear for it to have much opportunity to participate effectively in the battle. Both the French and American armies averaged 2-3 km's on the second day, faced with difficult terrain and German counter attacks. On the 28th the French left flank was reinforced and Auberive was taken. Although the German resistance was strengthening and their artillery becoming more effective the allies still managed to make gains, Somme-Py falling to the French 11th Corps, Maure to the 9th corps and the Americans reaching Brieulles, the Bois des Oignons, Binarville and the farm of Ivoy. The weather began to hamper operations as the pouring rain turned the Champagne battlefield into a sea of clinging mud making it difficult for supplies, ammunition and artillery to move forward. On the 29th the French advanced 4km's to take Mont Cuvelet, Sechault and Ardeuil. The Americans met stiff resistance and their advance bogged down. On the 30th of September the French 14th Corps was stopped but the 11th Corps at Somme-Py continued to push the Germans back. The 21st corps passed the ravine of Aure. Further along the front the French 2eme corps took Marvaux, reaching Monthois. The 38th corps reached the forest of La Malmaison while the first cavalry division (on foot) battled for Conde-les-Autry. In five days the men of Genral Gouraud and Pershing had penetrated the German lines to a depth of 12km's. The 174eme Regiment d'Infanterie had participated in the first wave of the attack, helping to take the butte de Souain and Somme-Py. On the 29th it was moved into reserve but on the 2nd of October it attacked again taking the Crete (ridge) d'Orfeuil. On the 4th of October it moved into the second line again. On the 26th when the French attacked the right wing of the bayer. Ers. Div. was pierced, surrounded and nearly destroyed. The danger of a general breakthrough was possible in this sector. The 15th and 1st Bavarian divisions counter attacked right away throwing the French back over the railway tracks to the east of Somme Py. The first wave of attackers had been held, all other attempts by the French were held back by the Bavarians. The remains of the Bavarian Ersatz Division were distributed amongst the other divisions. Pulled from the front line the Bavarian divisions returned to fight at the North of Somme Py in the first days of October, each of the divisions could field approximately 200 rifles.... little more than a company. 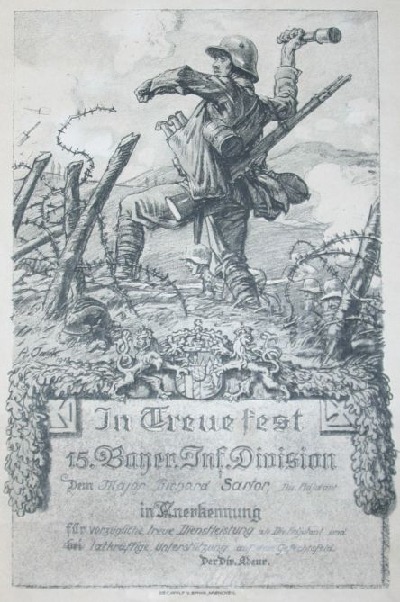 At the end of October the 15th Bavarian division was fighting the General Pershings troops as they held the line at St. Juvin, to the east of Grand Pre.